As a fellow cyclist, have you ever heard of and/or considered participating in the AIDS LifeCycle Event? And, what would it take to get you involved? I've never heard of it (before today, anyway), but all it would take is a free week and whatever money I had to contribute! It sounds like a great event in so many ways. In what ways does AIDS LifeCycle Event sound like a great event? 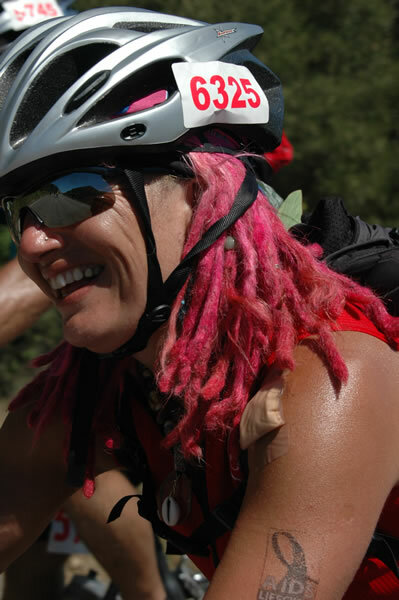 AIDS LifeCycle excites the hell out of me because "pedal power" excites the hell out of me. The realization that I can go anywhere I need to by the strength of my own legs was almost religious to me, and to see that principal en mass over hundreds of miles would be something both humbling and empowering. I think an event like this would naturally work for the greater good, and to be a huge source of revenue for fighting a horrible pandemic...I'd surely hop on a bike for that. Present Location /Where do you live? San Francisco, CA 94107 - (On the hill baby, Potrero Hill). Favorite Book: Agghhh, this is a tough one, there have been different ones for different times, perhaps The Alchemist as this came to me at a pivotal time and I have re-read it many times and given away a number of copies... I love books and I love so many of them. 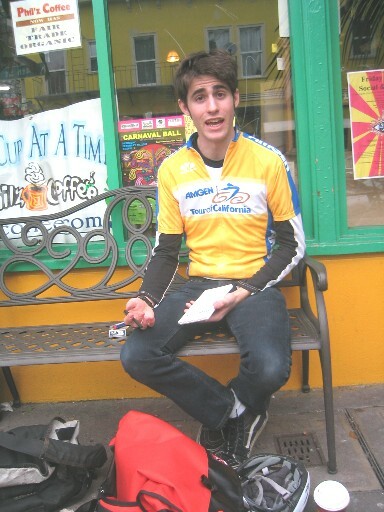 As a 3rd Year AIDS LifeCycle Cyclist, could you share with us the "Day 7" Experience? Between now and the last day of the ride, Day 7, we will go through so many experiences. The days are long and the mornings are very early. Before we know we are all lining up at the Cow Palace for Day 0 (the day we hand in our bikes, do the final paperwork, get tent assignments and go home to find ourselves unable to sleep). Others will tell you about the days between Day 1 and Day 7. My task is to cover Day 7. At the beginning of our week long journey Day 7 seems far away. By days 3 and 4 some of us are wondering whether we will make it to Day 7. And then we get to Red Dress Day, Day 5. Day 7 takes us from Ventura along some of the prettiest parts of the route and some of the most dangerous. Surfers and drivers of large "Malibu-esque" Mercedes, Bentleys and the likes don't seem to have much respect for cyclists also travelling along the Pacific Coast Highway. It is a day to keep your wits about you - which can be challenging. Also, it is the day before we re-enter the "other world" (the one that we left seven days ago and the one that will never seem the same after a week with the AIDS LifeCycle community). Also, It is a short day mileage wise, coming out at about 65 or so (piece of cake after the week of cycling every inch and every hill between Northern and Southern Cali). I know that for myself it is one of the harder days. My tent is on the van until next year, my week of camping and cycling and being around a giving, like minded community is over until next year...yet, it is not over, because whilst we have HIV and AIDS it will never be over. Day 7 is a day of triumph and a day of sadness - we have made it, done our part, raised millions of dollars (definitely triumphant in that respect). It is sad because we are still living with HIV and AIDS. And that sadness becomes triumphant once again because even though we are still living with HIV and AIDS and many seem to have given up on the cause, i we, on the other hand, have not given up. We continue to rally each year to raise funds, get ourselves fit for the challenge - because we know that if we don't no-one will.